It was a hazy day. Just one of those days where you'd rather lay in bed where it's warm, instead of climbing out to the chilled air. Was it night still? I couldn't tell, the sun was masked by the clouds which made it look like I should crawl back into bed. I had to go though. I already missed this class once this semester and it's only the third week. Did I miss it once or twice? I don't remember. Either way, I had to get up. The day went on as normal. But when I returned home I was greeted by the strangest thing. 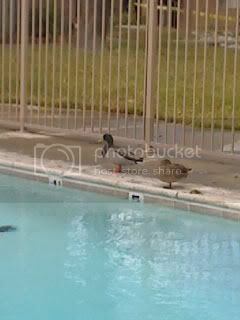 Two ducks sitting by the pool in my apartment. Just hanging out. It's things like that make it worth it to go outside. The best part is that those little guys are still out there, some 9 hours later. They're sleeping now. I hope the management doesn't chase them away in the morning. I kind of want to catch them and make them my pets. Jenn said no. If they just stay around the apartment that'd be good enough. I think I'll go feed them.